I have a guest blog post to share with you today, from author Dorothy M. Place. Her new book, The Heart to Kill, was released late last year. Be sure to read the excerpt at the bottom of this page. 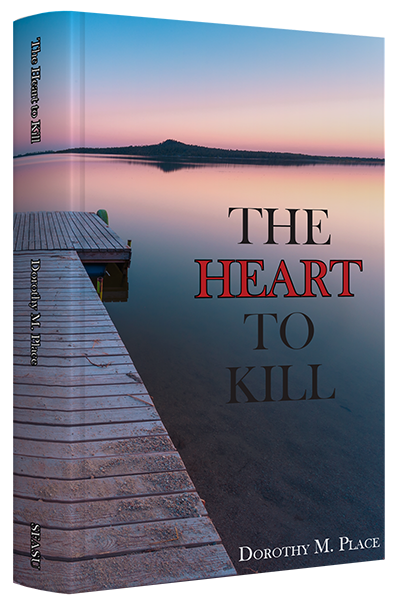 As of June 30, 2017, SFA Press is offering a thirty percent discount on the novel, THE HEART TO KILL, by Dorothy M. Place. This story, about a horrible crime and an enduring friendship, was awarded gold by the Literary Titan book reviewers and Sarah, the protagonist, was nominated as one of the five best characters (2016) reviewed by “My Train of Thoughts.” To read about the book, how it came to be written and to take a virtual tour of Eight Mile Junction, the town in which the story takes place, please visit the author’s website, www.dorothymplace.com. To order the book and obtain the discount, visit http://www.tamupress.com/product/Heart-to-Kill,8673.aspx and enter the code 3B in the appropriate box. “Dorothy M. Place lives and works in Davis, California. Since submitting her first short story in 2008, she has had eleven stories accepted for publication in literary journals; three have been awarded prizes and one, a fellowship. Her debut, literary fiction novel, The Heart to Kill, was published by SFA Press (2016). A collection of fifteen short stories is being prepared for marketing to agents/publishers this spring. Her second novel, The Search for Yetta, is in process. “The Heart to Kill is a story of a horrible crime, an enduring friendship, and personal illumination. Sarah Wasser, a student at Northwestern University Law School, returns to her apartment one evening to find two telephone messages. The first is that she has not been chosen for a coveted internship for which her father has arranged an interview; the second is that Sarah’s best friend in high school, JoBeth Ruland, has murdered her two children. “To mislead her father about her failure to obtain the internship, Sarah secures a position on JoBeth’s defense team and, against her father’s wishes, returns to her family home in Eight Mile Junction, South Carolina. She sets out to become a vital member of her friend’s team and regain favor with her father, only to find that she is not well-prepared for working in a community rife with chauvinism, malice, duplicity, and betrayal. Her efforts are met with the benevolent amusement of the senior law partner, the resentment of the expert trial attorney, the rush to judgement by the folks of Eight Mile Junction, and the discovery of the role of several individuals in the degradation of JoBeth. The Hungry Monster Book Reviews awarded The Heart to Kill its gold award (February 2017). “She looked to the sky, searching for the moon. Now a small sliver, it seemed to be hanging precariously from the branch of a nearby tree, like an ornament, belonging more to the tree than the sky. Then, after taking a few steps back, Sarah watched the moon fall off the branch and return to its proper place among the evening stars. Funny thing about perspective, how a small change in one direction can dramatically affect everything else.” – The Heart to Kill, by Dorothy M. Place. Thanks for the boost, Miss Paws. You deserve credit for the assistance you give first-time authors. These days, publishers do not do much to promote our books. If it was for those like Miss Paws, authors like me would be friendless.